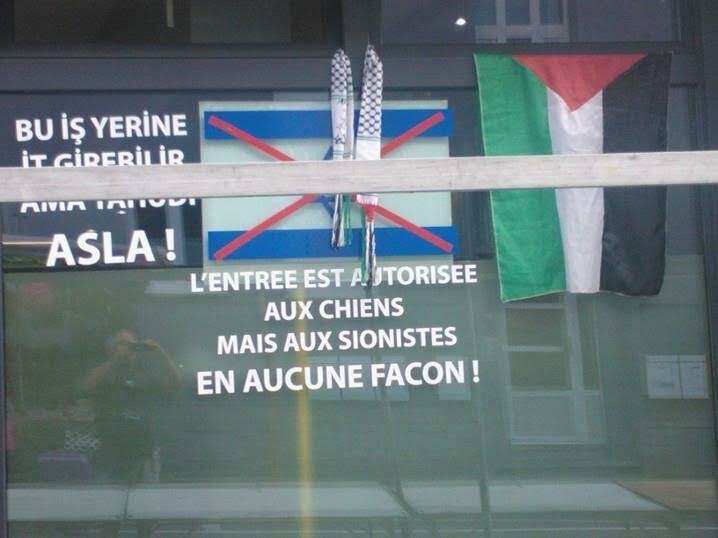 Last summer a café in a suburb of the Belgian city of Liege exposed the current face of anti-Semitism in one compact store-front display. Nonetheless, politically correct constraints in French clearly don’t cramp Turkish styles. Lest any perplexed Turk encounter difficulties in determining who’s a Zionist, the Turkish sign spelled things out explicitly – without synthetic attempts at European niceties. It let the proverbial cat out of the bag for dog-lovers and haters-of-Zion alike. The bit about Zionists was exclusively for European consumption. Ever since the end of WWII, undisguised anti-Jewish harangues have lost their erstwhile luster in much of the continent. Anti-Israel and anti-Zionist discourse, however, provides socially acceptable alternatives. Nowadays, in fact, these substitutes have become the obligatory fad for the fashion-conscious. Careless about prevalent conventions, though, the Turkish café-owners clearly illustrated that the terminology can be used interchangeably. If anything, anti-Zionist and anti-Jew are synonyms, despite expedient denials by disingenuous Europeans and Arab propagandists. The mundane justification for Europe’s resurgent in-your-face anti-Semitism is that it’s nothing of the sort – that it is just a warranted protest against Israeli policies. The inference is that the vehemence is very ad hoc and that it would dissipate in a jiffy as soon as the particular Israeli provocation disappears. The problem, of course, is that the causations and characterizations of these alleged provocations are hard to pin down. They vary and mutate faster than viruses do. Any Israeli deed in any sphere of human activity can be skewed into a misdeed and any misdeed into a hair-raising crime against humanity. Israel’s so-called criminal record becomes too all-inclusive to be taken at face value. Eventually one must arrive at the unavoidable understanding that Israel can do no right and that, by its very existence, Israel constitutes an obnoxious entity – a grievance that must be removed. Hence the clamor for supposed policy modifications is nothing that can be satisfied as long as Israel continues to exist. A variant pretext to the above is the wholesale objection to Zionism. Seemingly this is a deeper, more intractable layer of the widespread anti-Israel agenda. Here there is no pretense that the antipathy can dissipate with any change of direction by Israel’s officialdom – short of national suicide. The underlying anti-Zionist premise is that Israel is by its nature irredeemable, never mind its policies. Plainly, the national liberation movement of the Jewish people – which is what Zionism is – must be cancelled outright for the Jewish people to be maybe forgiven. This would perforce mean that to be accepted Jews must disown their national identity, hopes and self-determination. Taken to its logical conclusion, anti-Zionism demands that Jews be singled out detrimentally from all other nations and renounce their very right to nationhood. Only that, in the enlightened worldview of anti-Zionists, would constitute elementary justice. Anti-Zionists hanker to see Jews – as distinct from every other group on the face of this plant – made homeless once more, scattered and, above all, powerless. At the very least anti-Zionists want Jews to be put yet again at the mercy of nations which have abhorred Jews from time immemorial – be it with foaming-at-the-mouth fury or genteel deceptiveness. And all this, by integral anti-Zionist logic, is nowhere near anti-Jewish – certainly nothing that merits the anti-Semitic designation. Peculiarly, while the ancient Jewish nation gets their goat, these same “non-anti-Semites” have clasped to their bosoms the national claims of the Palestinians – those who until yesterday spurned the very name Palestine and denied that they comprise a national aggregate separate from the great pan-Arab lot (or its Syrian/Iraqi subdivision). Astonishingly all these incongruities pass right under the radar of pompous European pontificators. There is either too much intellectual fodder to chew and digest or a reluctance to be bothered by Jews whom they never liked much (although that by no stretch of the refined imagination should be construed as anti-Semitic). But occasionally – as in the Belgian eatery – proclaimed opposition to Israeli policies, anti-Zionism and zealous pro-Palestinian bias all coalesce in one indisputably anti-Semitic package. Although in its essence the combination targets the Jewish national affiliation, it is not unlike yesteryear’s hate which targeted the Jewish religious affiliation. In both cases Jews are reviled because of who they are. For millennia the Jewish faith was the pretext for singling Jews out and subjecting them to all manner of unusual punishment. The adamant demand was that Jews convert and cease being Jews in order to be tolerated. This, however, didn’t necessarily work and the deadly hounding continued. Those who envied the talents and accomplishments of conversos accused them of having been only outwardly baptized in order to avoid persecution or expulsion. The suspicion, for which conversos were tortured and burned at the stake, was that they continued to practice Judaism on the sly. No matter how the “new Christians” tried to escape the Jewish fate, their “bad blood” got in the way. The same is true today for assorted Israeli artistes and academicians who do their darndest to dodge the impediments that rampant anti-Zionism places on their upward mobility. So – like some of the conversos of old – Israeli authors, professors, filmmakers and performers spare no effort to distance themselves from the Israeli collective. They figured out early on that it pays to win Judeophobic European influence, fellowships and fans by stressing how virtuously different they are from the distasteful denizens of the sinful Jewish state. Evidently, this is a prerequisite to successful careers in places where Israeli associations aren’t opportunity-boosters or profit-promoters. For self-important aspirants this has long surpassed the unseemliness of negligible kowtowing to the Jew-revulsion that parades as Israel-bashing abroad. With apparent relish and calculated consistency, they hurl their explosive invective at their compatriots’ defenses. Anti-Israel diatribes by obsequious Israelis are gloatingly presented as giving the ultimate authority to our existential enemies’ cause. Nothing is sweeter to professed anti-Zionist ringleaders than justifying their BDS (boycott, divestment, sanctions) initiatives with quotes from leftwing (often anarchist) Israeli collaborators. The latter also sometimes sponsor boycott drives or with much ado circulate anti-Israel petitions. So intense is their disparagement that they needn’t actually call for BDS – at least not directly – to fan its flames with their self-serving rhetoric. Those Israeli literati and celebs most popular in Europe are almost without exception those who seek approval by highlighting their disapproval of Israel. Europe showers accolades upon them. Like it or not, they prepare the ground for BDS. Ultra-leftist Israeli singer Achinoam Nini, known in foreign lands by the more pronounceable and catchier Noa, has declared for all Europe to hear and be impressed that the Netanyahu government doesn’t represent her (ostensibly she’s exempted from voter verdicts), that it engages in war-mongering and that it’s guilty of an appalling array of awfulness. While having formally steered clear of endorsing BDS, Nini has prodigiously blamed Israel’s elected leadership for this anti-Semitic manifestation. Mind you, she’s not boycott-shy herself. She assiduously snubs venues beyond the Green Line (the now-hallowed 1949 Armistice Line). She shunned an ACUM (Association of Composers, Authors and Publishers of Music in Israel) awards ceremony in 2014 because Ariel Zilber, whose rightist views are anathema to her, was among the laureates. Therefore, there’s no denying that a tad of shameless vindictive pleasure was derived from the comeuppance dished out to her by BDS hecklers during a recent concert in Spain. Those versed in the Shakespearean idiom might describe Nini as having been hoisted with her own petard. The petard (or petar) was a battle device filled with gunpowder and used in bygone centuries to breach enemy fortifications. At times, the apparatus would explode erratically and do to its operators what they had intended to do to others. Following the strident incident, Nini righteously complained on Facebook that “the Boycott movement wants to aggressively shut my mouth by bullying and slander” despite the fact that she, alas, is a famous peacenik. As per her sanctimony, “art is for freedom and dialogue” – unless of course it’s Zilber’s art. Not to mince words, Nini basically avers that leftists like herself, deserve considerate exemption from BDS – presumably also from Arab/Muslim malevolence. One must only wonder whether Nini’s avid pro-Palestinian polemics would have won her exemption from the Liege café ban. Going by the French wording, she might just have been able squeeze into the premises and be accorded the privilege of rubbing shoulders with its free-thinking patrons. However, odds are that the proprietors’ genuine preference is for the Turkish phrasing. From their undiscriminating perspective there’s no difference between Noa and Ariel. They would eye both with equal disdain. That’s the anti-Semitic bottom line – Jews are despised regardless of who they may be, regardless of what they believe, what they say, do or achieve. Anti-Semitism, its convenient camouflages notwithstanding, is the great equalizer of all Jews. You can comfort yourself with Obama’s latest claim that he’s the closest thing to a “Jew” that ever occupied the Oval Office. There now, don’t you feel better already? Obama really said this ?! Sarah, you are the queen of political prose…I can’t resist to say this ! what happened to Nini was very well deserved. At least : I AM A ZIONIST ! I wonder what the next step is for Achinoam Nini and people of her ilk. It seems to me they will have two roads to take. On the one hand, they may realise that the philosophy of the people within the BDS movement is such that no matter how ferociously these sympathisers from within criticise their countrymen and how pliant they are in espousing the contempt of the delegitimisers, they themselves will never benefit from a camaraderie made possible by a differentiation of them from the collective: they are forever guilty of ‘Zionism by association’ by circumstance of birth. Perhaps this will lead to an awakening of sorts, and either they will begin to work more constructively and rationally, or they will slink away into anonymity. The other possibility is that they will become even more venomously outspoken, doubling their efforts to gain acceptance and exemption from blanket judgment. It will be interesting to see how it all unfolds. So how do we defend ourselves from antisemitism from within and without?